As talked about in a previous article, fishing North Carolina provides you with the best of both worlds; fresh and salt water. Although many anglers flock to the state in hopes of getting offshore and fishing in the rich waters of the Gulf Stream for mahi-mahi, wahoo, marlin, sailfish and more, many anglers are content with sticking closer to shore. There is great reward in doing so, too. One popular area is Wilmington, North Carolina. Wilmington is a quickly growing city that brings in tourists from all over the globe to partake it Wilmington’s many great attractions like shopping, dining and beach going. But the lifeline of the city, as well as the amazing local fishery lies within the Cape Fear River. This 202 mile river is an angler’s paradise. It is possible, and quite a common occurrence, that multiple species can caught along its water system; both fresh and salt. Along the upper stretches, largemouth bass are plentiful. Here the water tends to have little to no salinity. This provides opportunity to catch many of your favorite freshwater species such as bass, bream, catfish and more. Further down the river, the water becomes a bit brackish. Here, depending on the time of year, you will start getting a mix of both fresh and salt water species co-existing. Not only may you hook a largemouth bass, but redfish and sheepshead are often times found among the same structure. This makes for some exciting fishing as you never know what you’re going to hook. Take the river down even further, and you find yourself near the mouth of the river as it empties into the Atlantic Ocean near Cape Fear; hence the river’s name. Here the salinity levels are much higher and pretty much eliminates the chance at catching any largemouth bass. And while redfish, trout, flounder, sheepshead all reign supreme in this area, bass fishing is still to be had. In early spring and fall, striped bass fishing tends to take over. Stripers are an anadromous species. This means that they live their lives in the saltwater, but make the migration into the freshwater rivers to spawn. This makes the ideal time to target striped bass. So regardless of your fish species of choice, a trip to the Cape Fear River can offer up a smorgasbord to any angler looking to feel the tug on the other end of the line. A truly unique slam involves a largemouth bass, redfish and striper. See if you can catch them all! 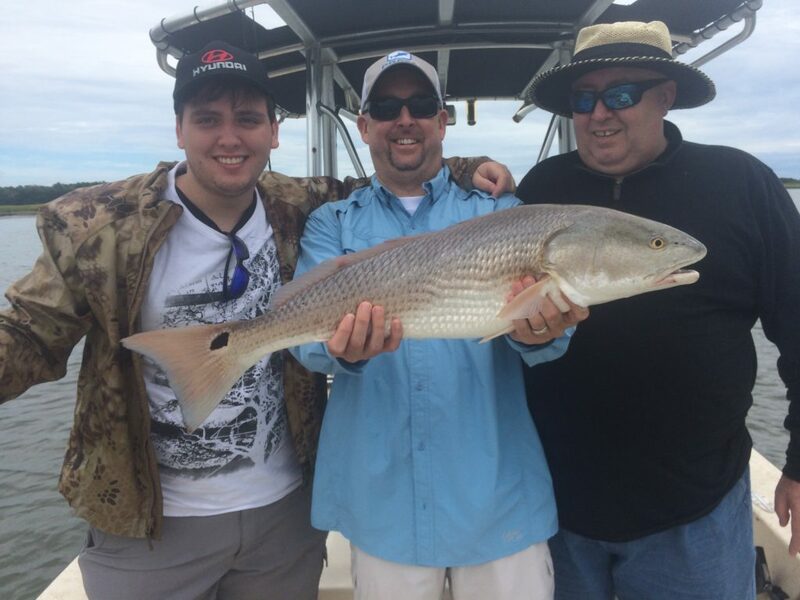 To explore this unique area with a local guide who knows the area better than most, reach out to Captain Mike Hoffman here at Wilmington.Fish Fishing Charters. Feel free to make fond memories by bringing the entire family!